As well as born and bred Brummies, Start Again works with many young people who are new to the country, including refugees and asylum seekers. Osman is originally from a mountain village on the border of Iran and Iraq. However, the ongoing civil war and escalating violence in the area forced him to flee his home at just 17 years old. Leaving home was a traumatic experience. After hiding out for a while, a neighbour organised for Osman to join a group of young people being taken out of the country for their own safety. They travelled – he thinks – for about three weeks, in a van and a lorry. Eventually, Osman was picked up by police wandering the streets of Worcestershire. He had no money or any personal possessions, and no real idea of where he was. After a night at the police station, he was taken in by Children’s Services and assigned a social worker, then sent to live with a foster family in Yardley Wood. They gave him a safe place to stay and introduced him to life in Birmingham. However, as soon as Osman turned 18, he was no longer entitled to foster care. Although his housing situation was no longer secure, Osman was keen to educate himself and find his own way. He kept in touch with his social worker, completed a basic English ESOL course and started meeting other young people from the Kurdish community in Birmingham. Then – knowing that one of Osman’s dreams in life is to become a professional footballer – his social worker introduced him to Start Again Project. Our first priority with Osman was to make sure he was housed safely. We allocated him an independent room, with his own bathroom and kitchen area, at our property in Handsworth – an area where, by now, he had made some friends. He urgently needed to see a doctor and a dentist, so Operations Manager Leah Harris supported him to register with local NHS services, and he also started to attend some football-based projects with our Sport and Wellbeing Coach, Chantel Hunter. Together, we identified Osman’s three main goals: to become more fluent in English, to apply to stay in the UK legally, and to take up a sports-based course. Whilst Leah helped Osman to navigate his visa applications and other important admin, Jamie Bunch, our Director of Sport, Physical Activity and Wellbeing, decided to take Osman to BMet (Birmingham Metropolitan College), where he would be able to find out more about their English courses and also try out for their football academy. He was accepted for both and started at BMet straight away. Going to Sutton BMet has been a really positive part of Osman’s development. 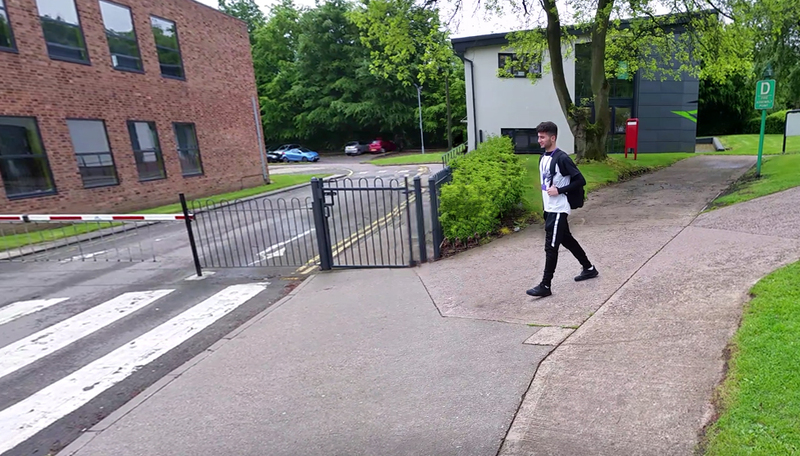 His love of football was the initial hook – he now represents the college team throughout the year and trains at least once a week – but he also studies a number of Foundation Learning (Skills for Life) subjects, including English and Maths, and has an average 93% attendance rate! Going to college has enabled Osman to broaden his horizons in lots of ways. Not only can he now speak English very well, and is on track to gain much-needed qualifications in the foundation subjects, but he’s built up the confidence to travel around the city and into other areas, and make new friends. This kind of confidence is the key to independence and self-reliance, which is something we would like for all the young people we work with. At home, Osman has been an excellent resident – paying his service charges, attending his appointments, and helping other residents when they’re in need. He also attends our “meaningful activity” sessions, including day trips and residentials, and currently volunteers on a football project aimed to engage other new and arriving young people aged 13–19. We’re delighted to say that Osman has now formally been given the right to remain in the UK for five years. We’re so pleased for him – he’s a lovely, conscientious, respectful young man, a role model to others, and we have no doubt he will continue to make progress. We’re working with him to make the transition to independent living and we know he will make a very positive contribution to society.